Time for another super awesome giveaway event :)!! Makobi Scribe is hosting the Unique Gift Ideas Event with a Sumo Lounge Beanbag Chair as the grand prize, so be sure to stop by her blog (and all of the other great blogger's giveaways!) for your chance to win! During this event, if you hop around to the other bloggers giveaways you will be sure to find tons of unique gifts! See the linky directly under the Rafflecopter form. Since there are so many unique gifts out there, I have decided to give away a $25 AMEX Gift Card so you can get any unique gift you'd like :)! 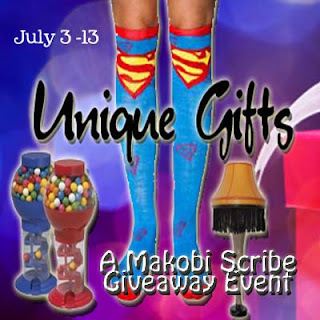 Makobi Scribe Reviews, LLC or the Father's Day Gift Event Bloggers are not responsible for sponsors that do not fulfill their prizes. That Sumo beanbag chair sounds really cool. Thanks for the giveaway! I would get my son some school supplies! I might buy my grandson some new summer/outdoor toys. I'd buy a kitchen gadget. You ask a very good question...right now I don't have a clue as to what I would buy. Will have to think on that. I'd put it towards my Christmas shopping. I save for it all year. I'd do something fun like go out for ice cream with the family. I would buy a new pair of flip flops. I'd put it towards the purchase of a tablet! I'd start on my sons school supplies. Some clothes for my grandkids, they grow so fast. I'd get some beach towels. I'm trying to save up to buy one of those electric muscle contracting belts! I'd give it to my daughter so she can get something for herself. I'd get my cats some flea protection. I would buy birthday gifts for my friend, their birthday is quickly approaching. If I win, I would most definitely buy books!! I'll probably save it for a rainy day! I would splurge on something for me! I would probably use it towards either pet supplies or household supplies. I would get my niece a gumball machine. a new pair of sandals. I would buy something for my 2 new grandchildren. Something on my Amazon wish list. I would get a new pair of shoes, my current ones are wearing out. I'd get some hair and beauty stuff. I would save this for my kids' Christmas gifts. I'd use it to buy food at Costco. I'd buy books or cosmetics. I might get some k-cups. If I won, I would buy the SpongeBob DVD that my daughter wants for her birthday. I would download some new music and shows. I would download some new music. If I won, I could put it toward a new fan because it is so HOT today with much more to come! I'd get a new Wii cardio game - thank you. I think I might get a new pair of shoes. I would buy a booklight! I would buy groceries :) *Thanks* for the giveaway! School clothes for my daughter, she starts Kindergarten this coming fall! I would try to replenish my stockpile a bit. I would get some local food at the farmer's market! i'd get a piece of sterling silver jewelry. We just got a Wii so I'd say a game for it. I'd probably buy some coffee and a new belt. I might get a box of chocolates from a small local candy maker that I love. Thank you for the entries! I'd get flowers if I won. - Judith R.
I'd give it to my Son as a Belated Birthday gift. I'm saving up for a laptop, so I'd put it toward that. If I won I would use it on our family vacation to get the kids a special treat. I'd probably use it toward dinner out with a friend. Thanks. I will get some hair accessories! I'd put it toward some new shoes for work. I would put it towards purchasing Adobe Illustrator CS for my art. I would use it for school supplies for my girls. thank you!! I'd use the $25 toward getting a new digital camera, I think. Thanks! Books! Cant get enough of em. I'm gonna say allergy meds right at this moment. Some back to school clothes for the kids. I'd take my mom out for lunch! I'd put this towards some clothes or groceries! I would buy some back to school supplies. i wouuld put it towards getting my son a leap pad. We are expecting a baby boy this month, so I will use the gift card towards something for him. Thanks so much for the giveaway! I would get a maxi dress for summer! I would probably use the gift card on Amazon! Thanks, Amanda! I would buy some nice groceries for date night in! some DVDs for my husband's birthday! I would put it towards a b-day gift for my husband next month. I would put the GC toward the stuff my oldest needs for college. Like a desk lamp, or a laundry basket, or a foot locker, or a coffee maker. I'd use it on school supplies for my kids. School is right around the corner. Summer goes by so fast. I would get dinner for me and my husband. I would get some household items or some cosmetics. I might get a pair of capris for the summer. I would get new jeans. To get dinner for my husband and I! I would get some school supplies. Books are my major weakness! I would buy myself some e-books I've been wanting from Amazon! I would order some natural makeup! I would get a new pair of jeans. Thanks for this amazing giveaway! I would love to win and get books and/or music! I might treat myself to some baseball cards! I haven't bought any in awhile! It would be nice to do that! i would use it to buy some stuff off etsy! I would take my wife out to dinner. If I won, I would buy a few more summer toys for my daughter. Leave a comment letting me know what you might get with your gift card if you won. I'd put it toward my dogs' distemper shots. I would take my sister out for a unique lunch! I might get the recent POKEMON movie for my son. I would buy gas for the car - Thanks!